Bicycle Sunday, Seattle’s version of ciclovia, returns again for 12 Sundays this summer from May through September. The 2 1/2-mile course on Lake Washington Boulevard between Seward Park and Mount Baker Beach will be closed to motor vehicle traffic from 10 a.m. to 6 p.m. on those days. That makes the shoreline stretch a magnet for everyone from families on bikes to road cyclists completing a loop around Lake Washington. The number of dates offered — 12 — are fewer than the 19 set aside for bicyclists, roller bladers, and other self-propelled folks in 2009 and 2010. The city reduced the number of Bicycle Sundays last year to accommodate several events. The Seattle tradition dates back to 1971. It’s certainly the best way to enjoy that winding stretch of blacktop along the lake without worrying about passing cars. The Cascade Bicycle Club, one of the sponsors, will be on hand at Seward Park from 1 to 4 p.m. on Bicycle Sundays to fit and sell bicycle helmets for $10. Bicycle helmets are the law in Seattle. 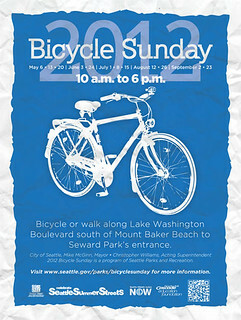 See the Bicycle Sunday brochure for more details about the event presented by Seattle Parks and Recreation Department. I would like more Bicycle Sundays. For instance why can’t there be one today, June 9? Thanks for the effort and money spent on this important family-friendly activity.